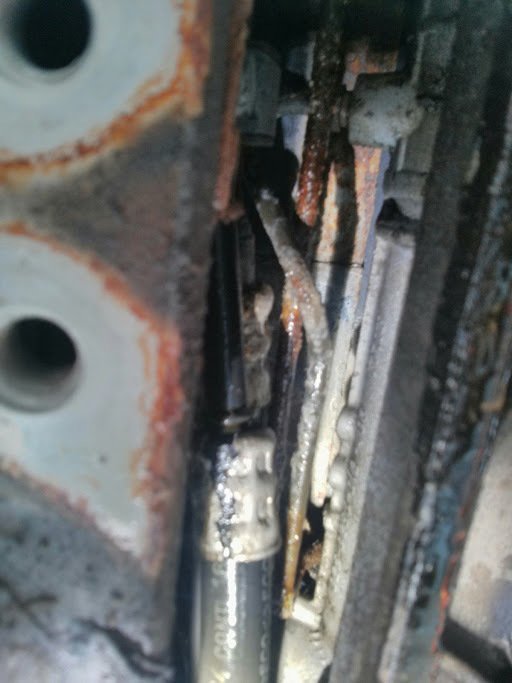 911uk.com - Porsche Forum : View topic - Leaking Power steering rack pipes (now replaced with saga). 911uk.com Forum Index -> 996 (1997 - 2005)> 996 FAQ > Leaking Power steering rack pipes (now replaced with saga). Posted: Tue May 09, 2017 8:15 am Post subject: Leaking Power steering rack pipes (now replaced with saga). The hard transfer lines on my steering rack went pop last night. They have been on my list to do for a long time....now they've been forced. PS you know that low pressure return pipe that everybody puts a jubilee clip on the split crimp from the NSF wheel arch? Well go have look at the other end of it - middle front above anti roll bar, you can just about see it. That end also had a split crimp on mine. Mine was making a bid for freedom, however the leak was from the crusty hard lines on the rack. You need to drop the ARB which involves removing 10 bolts. The bolt holes you see here are for the front of the crossbraces. Well what a saga it was replacing these. The splined end of the steering column is covered in a plastic coating. When the rack was dropped down off the column to fit the pipes, this plastic coating fell off. Without the plastic there is play on the splines. The early 996 has a one piece column from rack to wheel, later columns you can unbolt the lower part with the spline and UJ without disrupting the column. So the whole steering column had to be replaced AARGH. Column is over £1000 from Porsche. Lucky the column is shared with the Boxster and there are millions of these being broken. £50 for a low mileage column with intact plastic spline and some time to disassemble the interior. Yes i think the fact so many Boxsters were sold is the reason the 996 is so affordable to run. So many used parts and aftermarket (e.g. suspension arms) wouldn't be around without the boxster.